DIY Fireplaces and Pizza Ovens Together? Yes…of course. With any backyard comes building and design decisions. One of the great ways to spice up your space is to plan for more than two or even three things in one structure. 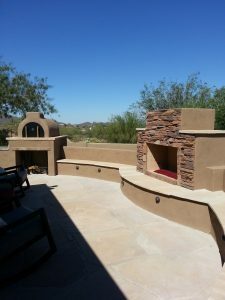 If you’re building a fireplace or an outdoor kitchen, then you should really think about incorporating a pizza oven into the structure. It will add some additional build time and some extra cost, but it is a lot of fun to build and use. 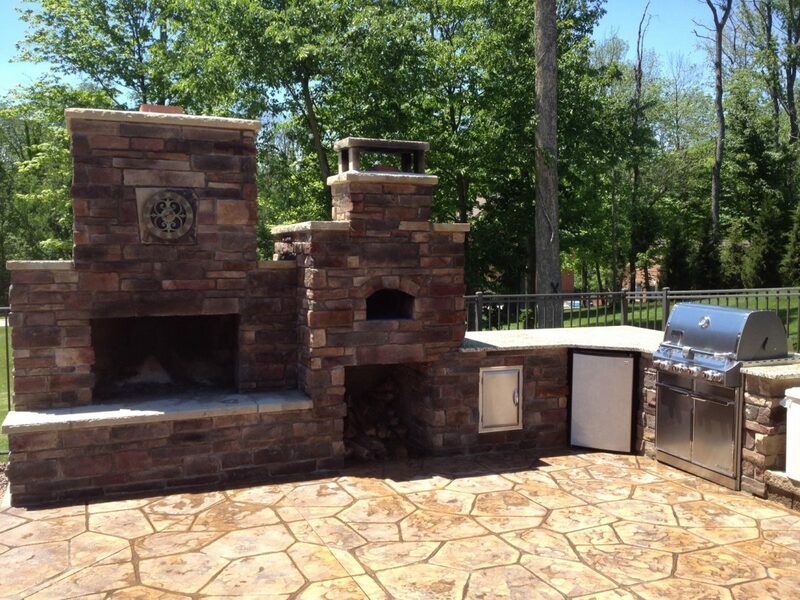 So when you are making decisions, think about a DIY outdoor fireplace and pizza oven combo. Pizza ovens, like DIY fireplaces, do not have to cost an arm and a leg. You can build them using pre-cut molds, making your construction very simple. There are different styles of pizza ovens, like barrel type or dome type. With the different styles come different looks and various sizes. The overall functionality remains the same however, as they will retain crazy amounts of heat. This crazy heat will cook pizzas in a matter of just a few minutes. Imagine having a backyard party with lots of family and friends hanging out. You’ve set out the pizza fixings and you have partitioned the pizza dough for perfect personal size pizzas. The sauce, the cheese, the veggies, the meat, all sizzling inside your pizza oven as each guest brings you their masterpiece to cook. Outdoor gas fireplace and pizza oven combo with lots of seating. 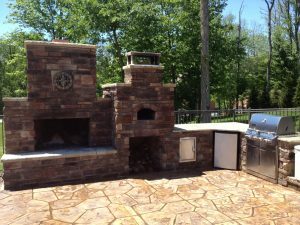 If you are intrigued about the possibility of a pizza oven incorporated into a fireplace or an outdoor kitchen structure, visit a great company, BrickWood Ovens at www.brickwoodovens.com. 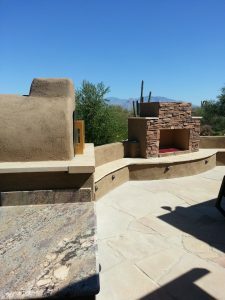 Backyard Flare, LLC has worked alongside owner Kevin at BrickWood Ovens, and we have used their foam molds to build very cool ovens here in Arizona. A beautiful slab of granite is at the perfect height to roll out the pizza dough right next to the oven. Visit the gallery at BrickWood Ovens and even at Backyard Flare, and you’ll see some great fireplace/pizza oven combo structures. The beauty is that both Backyard Flare and BrickWood Ovens cater to you, the DIY homeowner, who wants the challenge of building yourself. You can do it with construction plans, foam molds, some perseverance, ingenuity, and dedication and attention to detail. Great faux stone and some fantastic appliances are all a part of this beautiful fireplace and pizza oven structure. Give it a shot and if you need any questions answered, please call Dan at 520-269-9740 or visit Backyard Flare at www.backyardflare.com. I’m wonder if you have something that is a fireplace and also a pizza oven that share the same flu? Hey Clifford, it was nice talking to you on the phone. I hope I cleared up the combos and one chimney dilemma. If you have any further questions about a fireplace and pizza oven combo structure, let me know. I’m sure Backyard Flare, LLC can help you with your structure design. Combo structures incorporating both a pizza oven and fireplace would have to be built side by side for optimum performance. Pizza ovens need to retain heat so not as much venting is done. Sharing the same flue is possible but it would need to be calculated and thought out. Are you looking for a side by side structure? Hi Judy, have you visited our website at http://www.backyardflare.com? We offer several great designs and there is always the option of custom work if you want to design something of your own. Let us know how we can help. You can email me with any questions at dan@backyardflare.com. Have a good one.